Eriez Europe will be showcasing the latest solutions in metal detection and removal for the mining and quarry industries at the Steinexpo show in Homberg, Germany from 30 August to 2 September. 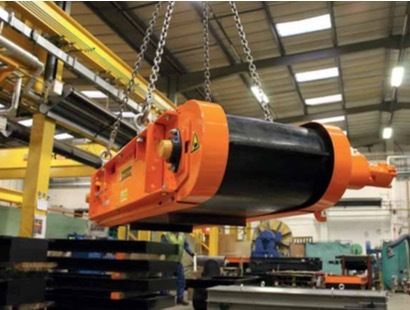 The expo is taking place in Europe’s biggest basalt quarry, and visitors to Eriez’s stand will have the first exclusive look at the new compact suspended permanent magnet. Eriez has focused recent developments on producing higher gradient multi-pole magnet blocks coupled with more compact, lighter weight and streamlined self-cleaning arrangements. The newly-designed magnet is lighter than a standard Eriez suspended magnet, yet offers comparable performance in achieving the highest levels of metal separation. The slimline, compact design features an internal frame simplifying the belt change process and is ideal for mobile crushers, shredders or screeners. For the removal of tramp iron in conveyed material or chutes, Eriez suspended electromagnets have been designed especially for the quarry and mining industries and are most effective when a deeper magnetic field is required. At Steinexpo, a self-cleaning model will be on display for the continuous, automatic removal of tramp iron. They are recommended where a large amount of tramp iron is expected or where there may be limited access to the magnet for cleaning purposes. Completing the product line-up at the show is the MetAlarm QM3500 bridge coil metal detector, suitable for use with steel-corded conveyor belts. The dual sensor coil model is ideal for higher material burdens and higher belt speeds. It is able to detect tramp metal above the customer critical metal size only, ignoring smaller pieces and preventing unnecessary stoppages of conveyors. Eriez Magnetics is recognized as a world authority in separation technologies. The company’s magnetic lift and separation, metal detection, materials feeding, screening, conveying and controlling equipment have application in the process, metalworking, packaging, plastics, rubber, recycling, mining, aggregate and textile industries. Eriez manufactures and markets these products through 12 international facilities located on six continents. Eriez Europe Ltd. has its head office in Caerphilly, South Wales, UK.